October 31, 2017, 12:41 p.m. In October, a Sheffield man legally changed his middle name to display his love for one of his favourite brands. Nathan Yorkshire Tea Garner made the move after a colleague said his 20 cups a day habit meant he should probably change his name. While Mr Garner took the steps to show his love for Yorkshire Tea of his own initiative (although the company did reward his dedication with a goody bag), how many people would be happy for brands to approach them directly to advertise their product in unusual and personal ways? New YouGov Omnibus research shows that only 6% of Brits would follow in Nathan Yorkshire Tea Garner’s footsteps (and only 3% would be willing to change their first name to that of a brand they liked). However, other means of sponsorship are far more popular. Brands have already started advertising by paying popular social media users (so-called "influencers") to promote products to their legions of followers. However, while no such opportunity is currently available to the majority of social media users, there is an appetite for it. 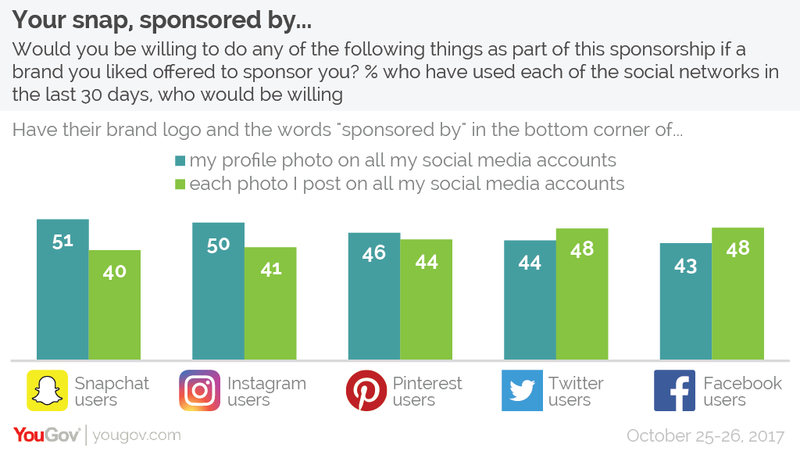 Four in ten (42%) Brits who have used social media in the last 30 days would be willing to have a brand logo and the words “sponsored by” in the bottom corner of their profile photo on all their social media accounts. Similarly, over a third (36%) of them would be up for allowing a brand to do the same for each photo they post on social media. Looking at recent users of individual social networks shows that half of Snapchat and Instagram users (51% and 50% respectively), would allow a brand they liked to advertise on their profile photo for cash. Four in ten (40-41%) of these social networks&apos; users would also be willing to let brands sponsor all of their posted photos. When brands sponsor major sports teams they already get bonus advertising from fans buying and wearing shirts – emblazoned with the brand’s logo across the centre – while they are out and about. Over a third (37%) of Brits are willing to take this a step further by wearing a shirt or top with a large picture of a brand&apos;s logo on it for a month. Around a fifth (19%) would be willing to do it for a whole year. More drastically still, one in twenty (5%) would be willing to get a permanent tattoo of the logo of a brand they liked. While sponsorship on cars and buildings is already widely practiced, currently it largely takes place on dedicated billboards and taxis. However, one in five Brits (19%) would be up for a brand placing a billboard on the outside of their home, while a quarter (24%) of car-owners would let a brand&apos;s livery and logo be painted on their vehicle. 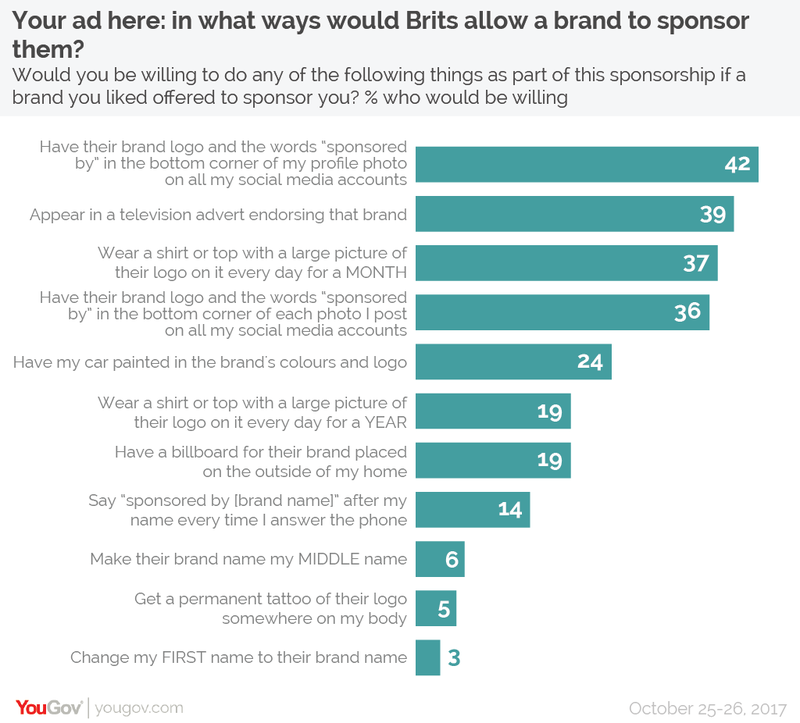 Finally, close to four in ten Brits (39%) would be personally willing to appear on television endorsing a brand they liked in an advert. While this was the second most popular form of advertising overall, it is also one of the most divisive, with young people being far more willing than older people to star in an ad (64% of 18-24 year olds compared to 26% of 55+ year olds). Similarly, men are more willing to take part than women (45% vs 33%).